Few scenes, from any film I've ever watched, make me as angry as those leading up to the murder of Honora Parker Rieper (Sarah Peirse) at the end of Peter Jackson's Heavenly Creatures. 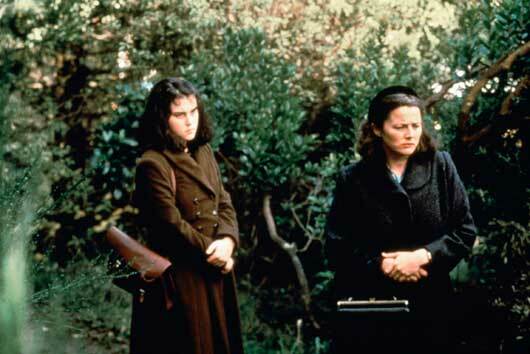 Honora is the mother of Pauline Parker (Melanie Lynskey), and it is Pauline, along with her special friend Juliet Hulme (Kate Winslet), who will commit the murder. They're having a day out, the three of them. Months of deep, familial strain are easing off Honora's shoulders as she enjoys her day with her daughter. This big day includes a bus ride, which pauses at one point so the passengers can refresh, and get something to eat. Honora, her daughter, and Juliet go to a cafe, and eat from a trey of little cakes. Honora is enjoying them very much, but isn't sure she should eat more, due to a conflicting desire to watch her weight. Juliet and Pauline urge her to treat herself, because they know that her waistline could not be more irrelevant. Honora doesn't need to worry about that, or anything, anymore, because this day, that Honora has been smiling and laughing through, jubilant over finally feeling some affection from her daughter again, has been planned by the two young girls as the day that Honora will die. Which she does, by their hands. The murder itself is awful, because Jackson gets across not only Honora's fear and pain, but her confusion, as well, which is a state of mind that in some contexts can be the saddest thing in the world. What makes me so angry about this murder, more than pretty much any other murder I've seen in a film, is that these two monstrous girls, Pauline in particular, don't know what they're throwing away with this imperfect but still good-hearted woman whose skull they're going to crush with stones. And they don't realize how deeply cruel the kindness they think they're showing Honora in her final moments really is. The bone-deep selfishness, if that word is even anywhere strong enough, of Pauline and Juliet is breathtaking. I hate watching these scenes so much that I rarely want to watch Heavenly Creatures at all, as great a film as I think it is. It is, in my view, the best film Peter Jackson has ever made that isn't Lord of the Rings. I just can't bear watching that poor woman end her days like that. Hell of a post as a lead-up to Mother's Day, isn't it? Well, I'll try to lighten things up by then. Ugh---god, yes. That line: "Go on, Mum---treat yourself" is one of the most chilling moments in all of cinema. And you're right---what really makes it so awful is that you have both a victim who doesn't understand what's happening, and a murderer who doesn't understand what she's about to do. It's just a merciless sequence. I can't take Honora's happiness. It's too much. I think I've seen the film twice all the way through, and any time I have an urge to watch it again, I think "Do I feel like putting myself through that again?" Since you possess a literary inclination, Bill, I'd be interested in hearing your thoughts regarding Juliet Hulme's post-prison life as the author Anne Perry. I don't know much about her work. Do you feel she's exploited the murder as fodder for her fiction? Tony, I remember being shocked to learn that Anne Perry was Juliet Hulme. I've never read Perry, but having worked in libraries and bookstores in my past, her books were everywhere. As for what I think of it...it's really bizarre, isn't it? My wife did read one of Perry's books (she didn't like it, for the record), and from what she told me it sounded like her stuff is pretty formulaic. It's not like we're dealing with Ruth Rendell here. If Hulme had grown up to be like Rendell, there would be a fascination that had at least in part to do with the quality of her work, but since Perry seems to be sort of cozy-mystery type, it all just seems rather creepy. It would be creepy anyway, I guess, to think that this woman who committed a murder in her youth then turned her imagination to murder mysteries -- and pretty highly remunerative ones, at that -- but the idea that she might also lack ambition as a writer throws, to me, a particularly odd wrinkle into things. But I've never read her. Maybe her stuff is better than I think. I remember reading an article about Perry years ago in which she made a point to slam the film for painting her and Parker as lesbians. That struck me as a pretty crazy bit of denial. I'm sure she has her reasons, but it's also my understanding that Parker's diary entires, as used in the film, were real, and verbatim. There's not a lot of reading between the lines that needs to be done there. But maybe that was just Parker's perception, I don't know. Either way, the idea that they might have been lesbians seems to me to be the last thing anyone should be upset about. Also, it's my understanding that Parker is basically a hermit now. She lives in some tucked-away village in New Zealand, or Australia. She is, or was, a schoolteacher, or librarian, or something like that. And a spinster, who lives as secluded a life as she can, never speaking to any reporters. "And a spinster, who lives as secluded a life as she can, never speaking to any reporters." Well, there is some solace in that. The film's existence makes for a bit of justice, I think. In a way it reminds me of the end of the Corinthian series of THE SANDMAN in which the Sandman gave the group of serial killers the most viscous punishment of all: he took away their dreams of who they were and made them see who they actually are.